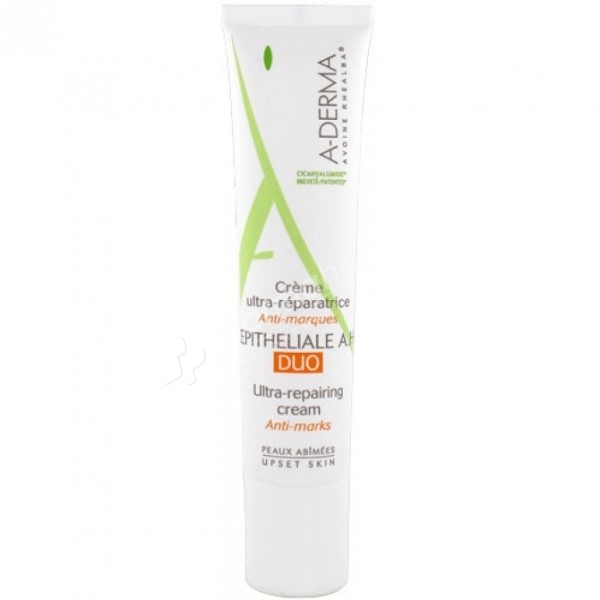 Aderma Epithelial AH DUO Ultra-Repairing Cream repairs damaged skin as a result of superficial dermatological procedures and skin changes that can leave skin marks. Ideal for the face and body, this cream is suitable for the whole family. It acts at a double level thanks to its patented active CICAHYALUMIDE which accelerates the repair of the skin and helps to reduce the cutaneous marks. Enriched with moisturizing agents, its invisible and non-sticky texture is easy to apply: it leaves skin soft and moisturized. The skin is immediately soothed, the repair is accelerated and the marks are toned down. Without perfume, paraben. Dermatologically tested. Hypoallergenic. Non-comedogenic. Apply 1 to 2 times daily locally or over an extended area. Water (Aqua), Caprylic / Capric Triglyceride, Glycerin, Butyrospermum Parkii (Shea) Butter, Dimethicone, Glyceryl Stearate, Cetearyl Alcohol, Palmitic Acid, Stearic Acid, Alanyl Glutamine, Avena Sativa (Oat) Leaf / Extract Stem (Avena Sativa Leaf Stem Extract) ***, Batyl Alcohol, Benzoic Acid, Caprylyl Glycol, Cetearyl Glucoside, Dimethiconol, Polyacrylate-13, Polyisobutene, Polysorbate 20, Sodium Hyaluronate, Sodium Hydroxide, Sorbitan Isostearate, Tocopheryl Acetate, Xanthan Gum. *** Oat Rhealba from organic farming.